Do you have someone in your life who absolutely loves mermaids? Does she dream of a life in the sea and spend all her free time on the beach? Mermaids are beloved mythical creatures featured in many books and movies. If you’re looking for gift ideas for a mermaid lover, we’ve got you covered. We’ve found 10 creative, original, and fun gift ideas for wannabe mermaids. 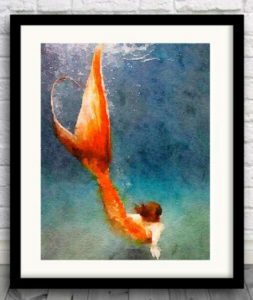 Any of these would make a perfect gift for any mermaid lover. Add some mermaid style to any outfit. These metallic mermaid scale tights comes in 8 different color options to match any outfit. 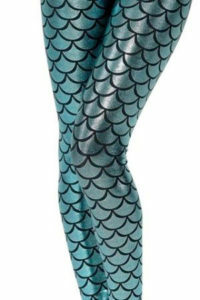 These tights make a great gift and are good for a mermaid costume or to jazz up a cute dress. 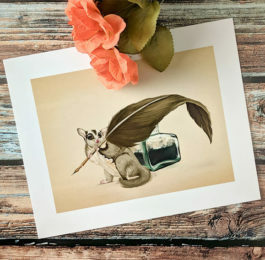 Any mermaid fan can have a print of Ariel, but this watercolor print is a unique and beautiful piece of art. Buy directly from the artist which supports her work and means it’s a creative gift you can’t find in stores. This jewelry box is gorgeous. It not only looks like a piece of art, but is a functional jewelry holder. 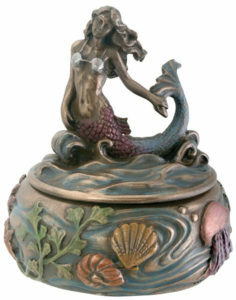 This mermaid jewelry box is so affordable you can even get them some jewelry to go with it. 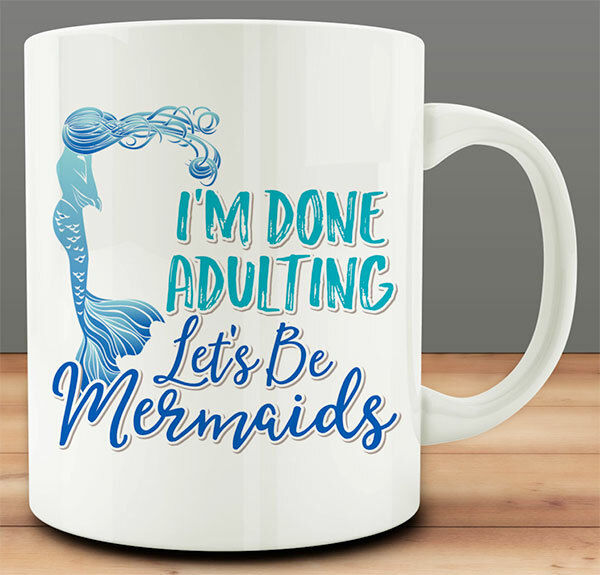 Shopping for a mermaid lover who also enjoys a nice cup of coffee or tea? This mug is the perfect gift. This ceramic mug features the fun and fishy design on both sides. Include some of your loved one’s favorite coffee or tea to make an unforgettable gift. During colder weather, everyone likes to cuddle up with a warm blanket. 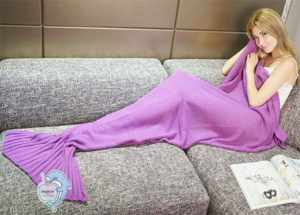 Well, with this gift, they can keep warm and feel like a mermaid at the same time. These beautifully crocheted blankets come in sizes for children and adults, in over 20 color options. 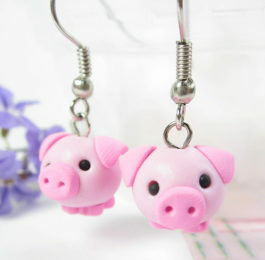 These earrings are a gorgeous piece you will not find in stores. 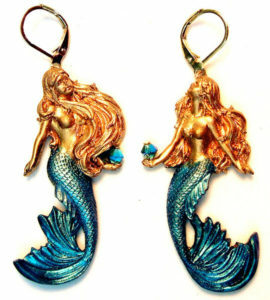 Handmade and designed by an artist in Colorado, these gold resin mermaids are handpainted with teal tails and feature a genuine blue Swarovski crystal. Many people now enjoy coloring as a way to relax and relieve stress. 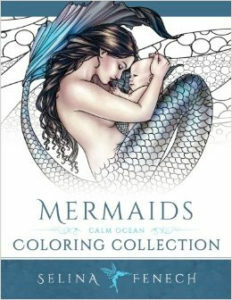 Your loved one can take advantage of calming coloring with this mermaids coloring book. It includes 50 pages of intricated and gorgeous mermaid images. Add some colored pencils and markers to make this the ultimate gift. This is a fantastic gift for writers or other mermaid lovers who like to keep a personal journal. 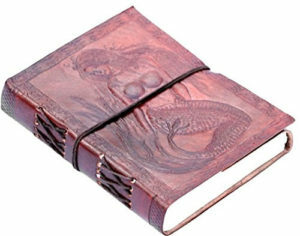 Made from genuine leather, it features an embossed mermaid on the cover. It includes 200 pages of recycled paper, ready for sea themed poetry or fishy daydreams. This is one of the most beautiful pieces of mermaid jewelry we have ever seen. Handmade by a French artist, each piece is completely unique. The mermaid is made from polymer clay with no painting. 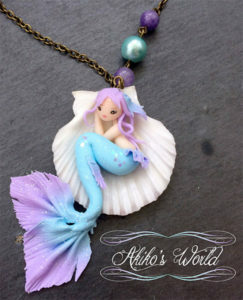 Any mermaid lover would enjoy this or one of the other mermaid necklaces offered by this artist. This is the ultimate mermaid gift. For any girl or woman who has dreamed of being a mermaid, now you can make that dream come true for them. This mermaid tail is more than just a costume, it’s actually engineered to be worn in the water. Great for parties or swimming in the ocean. 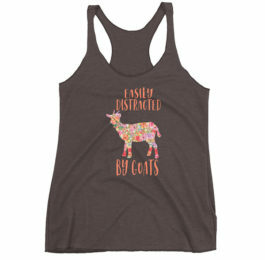 Available in adult and child sizes.